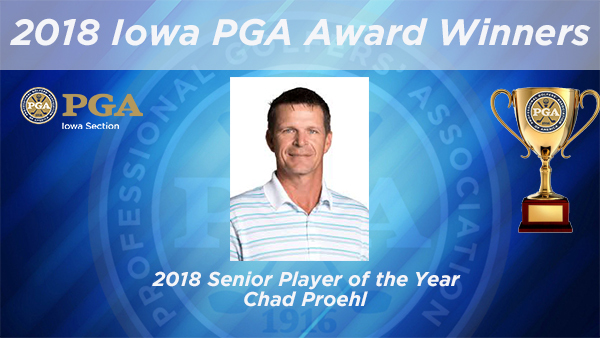 Riverside, Iowa – Iowa PGA Member Chad Proehl has won the 2018 Iowa PGA Senior Player of the Year. Proehl accumulated 1,397.50 points to win his first Iowa PGA Senior Player of the Year award of his career. Proehl’ season was highlighted by three appearances in PGA TOUR Champions events. He earned a sponsor’s exemption for the 2019 Principal Charity Classic where he finished T54. He also qualified for the 3M Championship, where he finished T71, and the Sanford International where he finished T70. Proehl also earned an exemption into the 2018 John Deere Classic as a result of his 2017 Iowa PGA Professional Championship victory. The 2016 Iowa PGA Player of the also qualified for the 52nd PGA Professional National Championship, which takes place April 28 – May 1, with a third-place finish at the 2018 Iowa PGA Professional Championship. He also qualified for the 30th Senior PGA Professional Championship where he finished T29 to advance to the 2019 KitchenAid Senior PGA Championship, taking place May 21-26, 2019. Proehl played in 11 Iowa PGA events finishing at the top of the Senior Division in six events. He also finished atop the Open Division at three events. Proehl finished in the top-five at 10 events this season and his T29 performance at the 30th Senior PGA Professional Championship was just enough to edge fellow Iowa PGA Member, John Bermel, to win the 2018 Iowa PGA Senior Player of the Year.